Have you ever wanted a quick and easy way to reuse content for future projects? 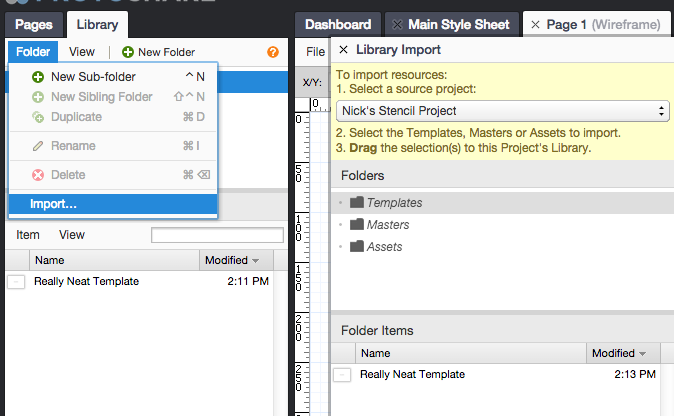 The Import function allows you to share Masters and Templates between any of your projects, but it might be hard to keep track of all of the different elements that you want to reuse if you have many projects. The best workflow to help mainstream the sharing process is by creating a unique project that acts like a central hub for all of the content you wish to save. You can create a Master or Template with the components that you wish to save and import it into your special library project. This will let you import your saved Master or Template from your library project into any future projects that you work on. Hi, I am using ProtoShare for Confluence (plugin version), is this feature available in that version of ProtoShare? Thank you. Hi Tammy, the plugin versions of ProtoShare do not include Library related features and are mostly intended for stand-alone design creation. Can this library be shared within a company for all designers to have access to a customized library of specific images they use. Hi Wayne, absolutely! You’d just want to be sure everyone on the team was a member of the project with the central library of images. Then, each Editor can import library items from that project into their own.